With a growing global population, many of which (925 million) are hungry, there is an astounding percentage of food that is going to waste. There are many variables as to the reasons for such an imbalance, but an astounding after effect is that this waste is actually contributing to excess carbon emissions in the world. The U.N. Food and Agriculture report of 2011 indicated that around one third of the world’s food products are uneaten, totaling 1.3 billion tons of discarded edible food per year. The Greenpeace report has indicated that the food industry is responsible for around thirty percent of the total world‘s carbon emissions. In addition to the gases produced by rotting food, the food industry production has a base in using fossil fuels. Between the fertilizers, transportation, production and packaging, food is causing a higher level of global warming than most people realize. 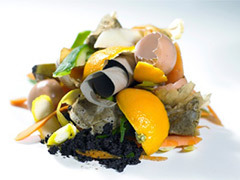 In the trash heap and landfills, the food waste produces methane gas and CO2. As a greenhouse gas, methane is twenty three times more potent than the CO2. Armed with this information, one may wonder why so much of the food waste occurs. This problem may be attributed to a cultural situation. The Western world is in a circumstance of requiring perfectly formed and colored foods, packaged just right and with the same appearance as we see on the overabundance of cookery shows. When you combine that with the mentality of the discount bulk buying in a falsely represented economy, you have a situation where people are buying more than they actually need. This equates to a rather disturbing fact that in American and Europe, consumer’s food waste tallies up around 95 to 115 kg of food each year. This is compared to South East Asia and Sub-Saharan Africa that total around 6-11 kg of food waste per person, per year. Posted on May 21st under Global Ecology. We have a collection of birds, raccoons and feral kitties. The little that we do throw out is given to them, so everyone benefits. Haven’t put any food in the trash in over 25 years, but I see what others waste and it is just a sin. We are a society of the overindulged and overweight, with a feeling of entitlement. There is no surprise that the landfills are overflowing with food that was probably perfectly ok, but someone decided they didn’t want it. I worked with a food bank years ago. We collected all of the waste foods from restaurants. You would be surprised what they throw away. Some of it because it’s older, but some because it just doesn’t ‘look’ as good as others. We are a spoiled society, where our food has to look picture perfect. Thankfully, those that are hungry aren’t that picky. I guess what all of our parents said when we were little was right about wasting food. Of course, I told my son the same thing when he was growing up. Thankfully, we don’t waste anything because we have a compost heap. We learned this from my Grandmother, who put coffee and eggshells on her roses and used the compost to fertilize the garden.